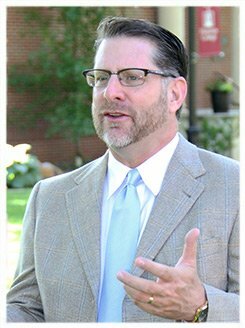 Dr. Travis Feezell became the 17th President of Hastings College in 2017. He has more than 25 years of experience in higher education, including service as an academic administrator, faculty member, athletic director and baseball coach. From 2014 through 2017, he was Provost and Chief Academic Officer at University of the Ozarks. There he served as chair of a successful strategic planning process as well as co-leading the Enrollment Management Team to oversee increases in enrollment and retention. In addition, he initiated academic and governance changes at the four year liberal arts institution which, like Hastings College, is affiliated with the Presbyterian Church (USA). Before joining University of the Ozarks, he served as a tenured professor as well as a special assistant to the president for strategic planning at Belmont Abbey College in North Carolina, and helped lead the college through comprehensive strategic planning efforts. He was also awarded the Belmont Abbey College Spirit of St. Benedict Award in 2012, which is the highest award for service to the college, and the Adrian Faculty Excellence Award in 2011. Feezell received a doctorate in education from the University of Idaho in 2005. Additionally, he received his master’s degree in medieval British studies from the University of Wales-Cardiff in 1992. He earned his undergraduate degree in English from the University of Wyoming. He taught at the University of St. Thomas and the University of Minnesota, Twin Cities, and was the director of athletics at Macalester College in Minnesota. He also served as a faculty member, chair of the Department of Sports Studies, director of athletics and head baseball coach at Whitman College in Walla Walla, Washington. A former Rhodes Scholar national finalist, Feezell is considered a leading scholar and speaker on issues of sport and higher education in America. Feezell and his wife, Carol, have four children: Jackson, Delaney, Colby and Cooper.